Alaska offers opportunities to harvest game and fur animals unmatched in any other state. However, no one may harvest game or fur animals without first acquiring the appropriate license and any tags, permits, or harvest tickets required for specific hunts. The links below include information on licensing options, purchasing licenses, acquiring permits and harvest tickets, and opportunities available to military personnel and elderly or disabled hunters. Nonresident hunters must buy appropriate locking-tags to hunt big game in Alaska — this tag is locked on the animal immediately after the kill and must remain there until the animal is processed or exported. In addition to a hunting license, some resident hunters must buy a brown/grizzly bear locking-tag or a muskox locking-tag if hunting these species. Please refer to the Alaska Hunting Regulations while planning your hunt to determine if you need a locking-tag. Most waterfowl hunters require a State and Federal duck stamp, a license, and proof of Harvest Information Program (HIP) enrollment. See License & Duck Stamp Requirements for more information. In addition, some areas require a permit to hunt waterfowl. See Waterfowl Hunting Permits to see if you need a permit. Most drawing hunts are available to residents and nonresidents and are awarded by lottery. The application period for drawing hunts is during November and December. Visit the Draw Information pages for more information. The Board of Game has authorized a number of programs under which game may be harvested for cultural and subsistence uses. Visit the Cultural and Subsistence Harvest Permits page for more information. Most registration hunts are available for both residents and nonresidents. For more information visit the Registration Hunts page. Tier I & II hunts are subsistence hunts and are only available for Alaska residents 10 years of age or older. Visit the Tier I & II Information page for more information. While most parts of Alaska do not require a special permit to hunt small game, there are a few areas that do. 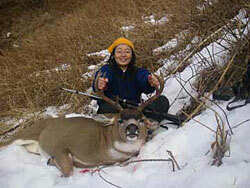 See Small Game Hunting Permits for more information. While most parts of Alaska do not require a special permit to hunt waterfowl, there are a few areas that do. See Waterfowl Hunting Permits for more information. The general season harvest is the type of hunting most people are familiar with - the basic hunt where you buy a license, get tags or harvest tickets for big game, and follow the general season dates and bags limits. Visit the General Season Hunts page for more information. Targeted hunts reduce animal-vehicle collisions and allow members of the public to selectively harvest game species that pose a threat to public safety or are likely to die as a result of an injury. Visit the Targeted Hunts page for more information. The Alaska Department of Fish and Game began offering big game harvest permits for auction or raffle in 1997. See Auction Permits for more information.